CorkSport is not only a renowned tuner of Mazda vehicles, but it's also a local company (based in Vancouver, WA). The company now offers a host of parts for the Mazda2, including an air intake, exhaust system, strut tower braces, a rear torsion bar, and a host of other upgrades, such as suspension components, from other companies. 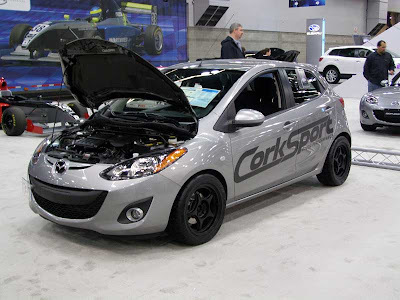 The CorkSport Mazda2 was at the Portland International Autoshow, which is where I snapped a photo of their hot hatch.You can read all about the company's tuned 2 on the CorkSport blog. Corksport is an incredible company with incredible customer service. I ordered a test pipe for my '10 MS3 and they answered all questions happily and even refunded me some money when they found a faster and cheaper shipping alternative? What other company would do that??? Corksport has a customer for life.